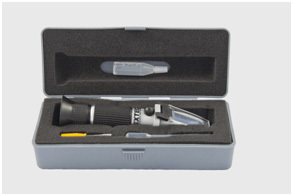 A refractometer is the most accurate tool to test freeze point of coolant in the field. It will accurately show the coolants freeze point and percentage of glycol to water, automatically compensating for variations in temperature. See your GFL representative to purchase one. Hydrometers are NOT recommended to test your coolant. They are highly inaccurate in the best of conditions, and greatly impacted by variations in temperature and impurities. Environmental Sustainability at GFL Environmental Inc.
As a “leading edge” recycler of coolants in BC for most of the last 6 years with clients that include major corporations, fleet operators, car dealers, utilities and an array of repair and quick lube facilities. We recycle a product that takes a lot of energy to produce, and which can be detrimental to the environment if improperly disposed. GFL’s existing recycling process generates about one fifth of the greenhouse gases generated by producing virgin coolants and then we buy carbon offsets! We are a truly carbon neutral option. In 2008 we installed a distillation process in order to upgrade the quality of our recycled coolants, which now meets or exceeds Original Equipment Manufacturers (OEM) and ASTM specifications. Vacuum Distillation has allowed GFL to recycle a larger variety of coolant waste streams. It has also allowed GFL to provide a more environmentally friendly high quality alternative to virgin coolants. GFL has an approved operational plan by the BC Ministry of Environment and has always complied with or exceeded their and OSHA requirements. As well we are audited by BCUOMA annually.